Mario Masuku and Maxwell Dlamini were arrested on 1 May 2014 after participating in a May Day gathering in Manzini. 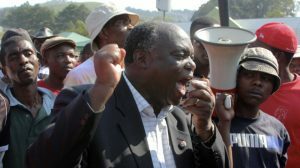 Masuku spoke at the gathering and Dlamini participated in the singing of songs, and both used the gathering to draw attention to various challenges facing Swaziland. They were charged with two charges of contravening the Suppression of Terrorism Act, and two charges of contravening the Sedition and Subversive Activities Act as a result of the statements they had made. Masuku and Dlamini applied for bail soon after their arrest, but this was refused. In October 2014 they made a fresh application for bail based on the presence of new circumstances that had arisen since the initial refusal, and bail was again denied. They appealed the refusal to grant bail to the Supreme Court and was released by the Supreme Court in July 2016. Masuku and Dlamini have also filed an application challenging the constitutionality of the two pieces of legislation under which they have been charged. This application has been joined with three other similar applications, and was before the High Court in 8 September 2015. Due to time constraints, the matter was postponed to 8 and 9 February 2016 for finalisation of oral arguments. Judgment was handed down by the High Court on 16 September 2016. The State has since appealed the judgment. Procedural arguments relating to the appeal are due to be heard on 19 March 2019.